Downhill or alpine skiing is so exhilarating. In fact, I like it so much I decided to share the history of snow skiing with you. What's really great is when it's so close to home. You can sneak in a few hours of skiing here and there. But, for the most part our family is just like anyone else's. Very busy, with little time for skiing between the other activities. When you do have the time or are here on a Lake Winnipesaukee vacation in New Hampshire, downhill skiing is a great way to spend the day. This is a sport you can do by yourself or with your family. 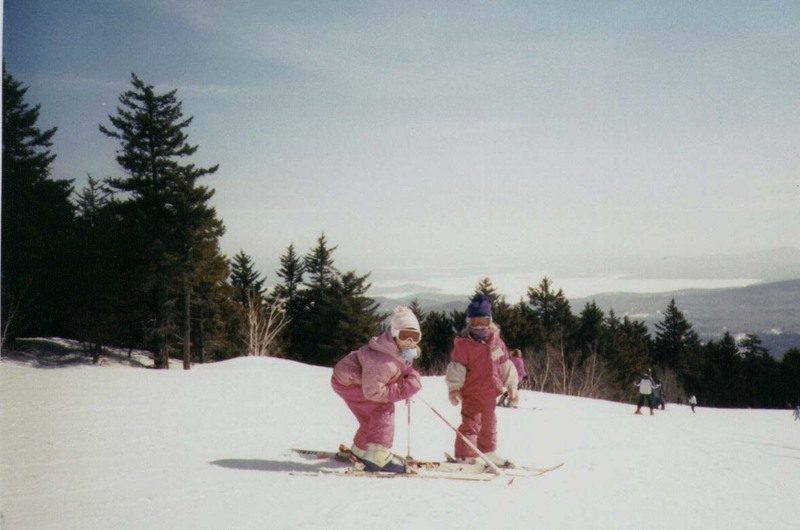 If you've never tried downhill skiing around Lake Winnipesaukee in New Hampshire before, there are local mountains as well as those a bit further away with great programs such as learn to ski and adaptive skiing. The smart thing is to get one of the rent/lesson packages. Many of these learn to ski packages will even guarantee to get you to a certain level of skiing. 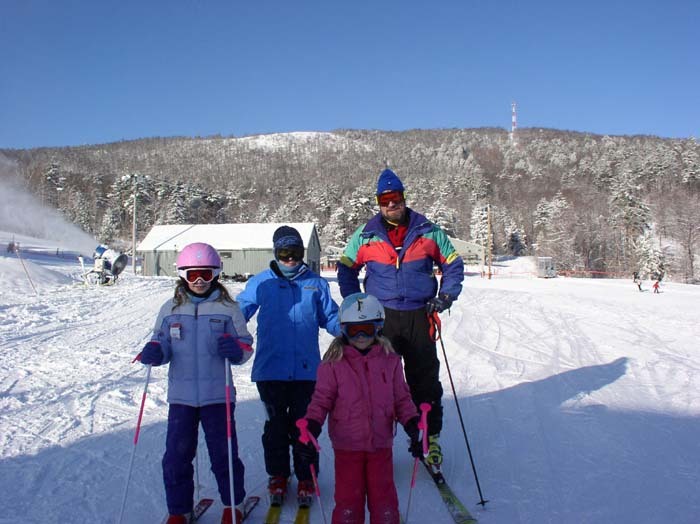 Most learn to ski programs include equipment and several lessons in a very reasonable package. You don't even have to to use the lessons in consecutive days, you can spread them out over time and practice in between. If you like it, then you might want to buy your own equipment. It's really important to ski with care whether you're a beginner or expert skier. I've compiled some safe skiing tips to make your Lake Winnipesaukee downhill skiing experience in New Hampshire fun and secure for everyone. If you're unsure of the weather and want to find out what type of snow there is on the mountain, you can look into the Lake Winnipesaukee skiing conditions. This will give you an idea of what wax to use on your skis and whether you should bring extra layers or not. Have you ever skied in the fog? It can be scary. Sometimes the fog is light and easy to go through. Other times, it's downright thick depending on where you are on the mountain. Check out my foggy weather skiing tips. Skiing tips for crowded trails can help you learn to maneuver around people to get you safely to the bottom. Learn to become a courteous skier while skiing on any mountain. Always remember the skier's responsibility code. Are you wondering what the different ski trail markings mean? To help you ski on slopes that are your level, I've explained the different trail markings you find in all the North American resorts. These different tree skiing tips will help you learn the best way to ski the glades when you're ready for some off trail skiing in New Hampshire. By following the above tips you should be able to have a fun and safe downhill skiing around Lake Winnipesaukee experience. If you do have a few spills, you might want to learn how to fall by following these tips to prevent a ski crash. You'll need skis and bindings, ski poles and ski boots. You definitely need goggles. Goggles help cut the glare plus they keep the wind off of your face. A helmet is recommended. It's a safety factor. New skiers tend to fall a lot. A helmet will protect your head from any injury. To keep warm, you'll also need warm gloves or mittens, coat, neck gator, ski or snow pants. If you're snowboarding, you'll probably get pretty warm with all the movement. You definitely need some type of waterproof pants because you'll be sitting on the snow quite a lot. You should have a jacket that you can move freely in, some gloves, goggles and a helmet. The snowboard equipment is a snowboard, snowboard boots and bindings. You don't use poles for this sliding sport. When I was growing up, I didn't know how to ski and didn't really care about it. I took a couple of learn-to-ski classes in college and promptly forgot everything as I didn't use it. About six years later, I got the downhill skiing bug. I took lessons, found discount passes to every possible ski area in New England. I just went downhill skiing everywhere. Nothing kept me away from a slope. Not even if it was too difficult. Then I met my husband, Dave. We skied everywhere together. But he turned my careless downhill skiing around and taught me technique. Now I have more sense when picking the slopes I ski down. Did I mention that Dave proposed to me at the top of a ski mountain? We have our favorite ski areas and luckily one of them is in the Lake Winnipesaukee area of New Hampshire. Gunstock Mountain! Don't forget your camera! 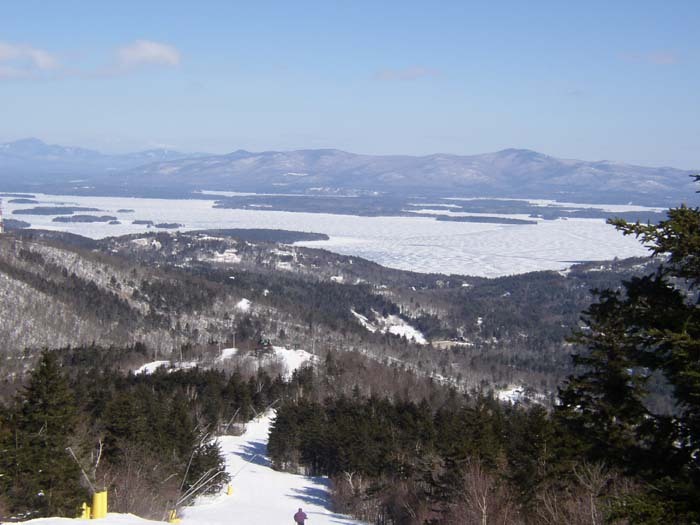 When you get to the top of Gunstock, there are breathtaking views of Lake Winnipesaukee and the White Mountain range in New Hampshire. When you get off the Panorama lift at the summit, you'll see what I mean. As you start downhill skiing down a little ways there are some great places to take a family photo with the beautiful background view of Lake Winnipesaukee. For your aprés ski time...or should I say, when you're done for the day and want to have a "hot toddy," stop in at the "Powderkeg." It's a fun place to eat a snack, have a drink or visit with friends. Kids can come with you, too! 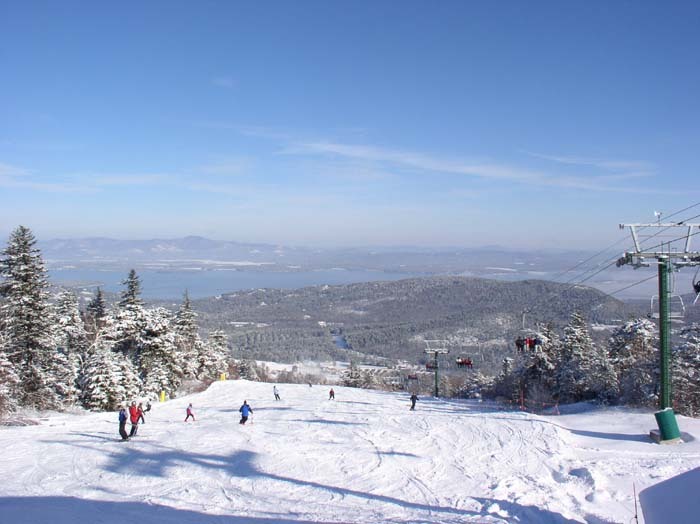 There are other wonderful ski areas outside of the Lake Winnipesaukee region. The closer ones are Cannon , Loon Mountain , Ragged Mountain , Sunapee and Waterville Valley. Each of those is a bit longer to drive to, but can add variety to a New Hampshire ski vacation. Even though it's fun to ski around Lake Winnipesaukee, Ski Magazine is a good source for finding other places to take a ski vacation outside of New Hampshire.